Gait defines our manner of walking and any correlated dysfunctions can deviate our walking from the norm. They can transpire from several underlying medical disorders including ones that involve the inner ear, Parkinson’s disease, muscular dystrophy, arthritis, neuropathy, stroke, vertigo, multiple sclerosis, disc problems, and musculoskeletal abnormalities such as fractures. The onset of gait and balance problems is very common as we grow older. It’s important to treat this issue as it could lead to falling, one of the major causes of injury among the elderly population. 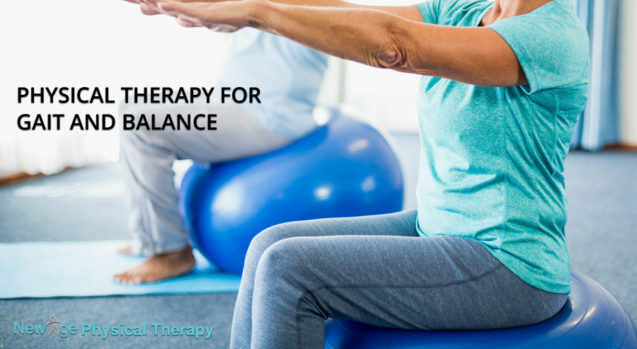 Most treatment plans for balance and gait physical therapy abnormalities involves exercises to strengthen the lower extremities. The main goal is to build up muscle back to its original state or above so the patient can perform activities of daily living without difficulties. The physical therapist will individualize the treatment program based on the patient’s needs, goals, and how much they can tolerate without injury or onset of pain. Every program would be catered to the patient’s specific condition. The best exercise programs will be changed routinely based on the patient’s progress to optimize muscle strength and balance. Pre-Gait Training. Your physical therapist may ask you to perform simple activities that can help improve your gait such as standing on one leg, marching in place, and walking heel first. Gait Training. Your physical therapist will observe, educate, and help you retrain your gait. Since an underlying vestibular, neurological, or muscular condition may be present, training will differ from patient to patient. Also, if your doctor requires you to use crutches after a surgery, your physical therapist will teach you how to use them properly while walking and using the stairs. Ultimately, the program will be modified to ensure the safest training. Balance and Coordination Training. Your exercise prescription may include balance activities to help stabilize your walking pattern. Neuromuscular Reeducation. If any inactive or weak muscle groups are affecting your gait, your therapist may enforce neuromuscular reeducation techniques to activate them. Bracing or Splinting. If your gait dysfunction is caused by the weakness or paralysis of a ligament, your physical therapist may teach you how to use adaptive equipment, like a brace, splint, or cane, to help you move.